A good overview of the new service opportunities for the field service industry made possible by M2M technology. We also shared our own take on how smarter M2M devices can address mobile workforce challenges. Carl Ford takes a look at how planning for satellite can solve the problem of ubiquitous coverage and lower the total cost of the solution at the same time. We’ll take a closer look at this issue on the Blog next week. A close to home look at some Canadian innovations from digital oilfield and vehicle tracking to new technology to make sure you never lose your keys again. Finally. 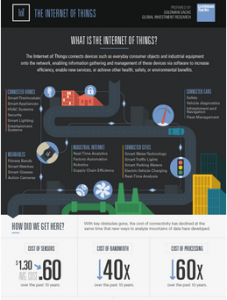 There are a lot of IoT infographics out there, and this new creation by Goldman Sachs is a welcome addition. Among the wide array of facts and figures is a summary of the plummeting costs of sensors, bandwidth and processing over the last 10 years.